Life has been going crazy! Just lots of stuff happening all at once. It's almost school holidays so I am looking forward to getting my house clean again. I will have time to organise though I am going to be lonely during the day. the Ho! Ho! Ho! by Full Circle Designs. It's on a random Polstitches fabric. It's a green coloured fabric which you can kinda tell here. I'm glad this is finished not sure why but I didn't really enjoy this one. Could be because I never got a chance to really sit down and work on it. It was my portable project. I have started another ornament. I went through my mini kits looking for christmas ones and I came to this booklet. 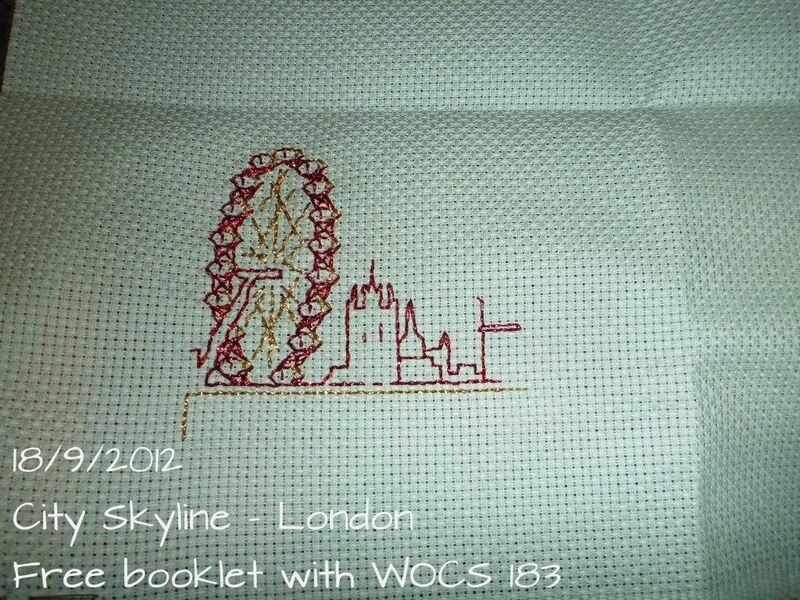 From Issue 183 of World of Cross Stitch it came with red and gold madeira metallics. So I am trying out some new threads. I actually like working with these madeira threads. They aren't fraying much at all. Which is great working with metallics. This is the City Skyline for London. I want to make up the whole set but see how I feel. This is done on 14ct light green aida. Not sure about the colour but it suits the Christmas theme. I bought some navy if I want to do more which will really bling. Also I have another new start. This one is secret, at least from Phill so I can only stitch it at certain times of the day. 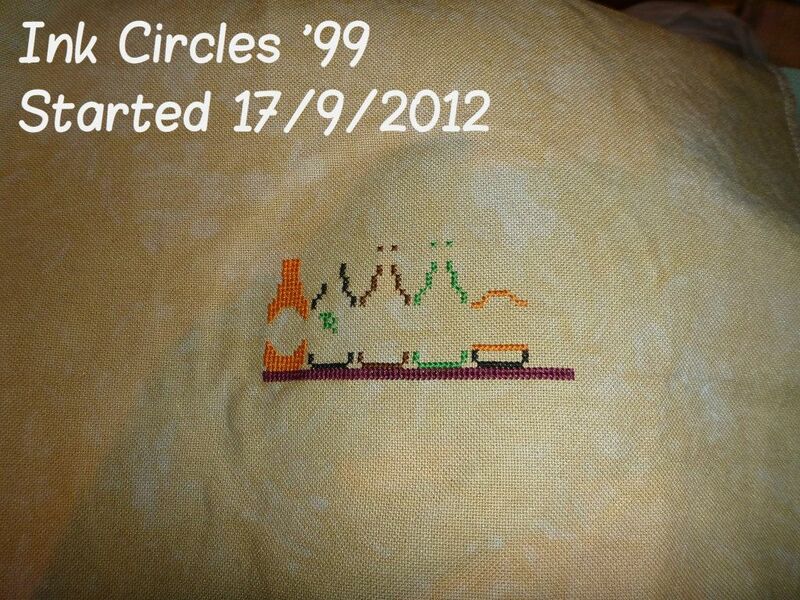 It's Ink Circles '99 which I love. I started it yesterday so there is only a little of the middle shelf done. Hope I can get this done by Christmas. Very cute ornament, and lovely new starts - love the London skyline! Nice finish and great starts! I haven't used Madeira silks for embroidery but I have used Madeira thread for machine sewing with excellent results. 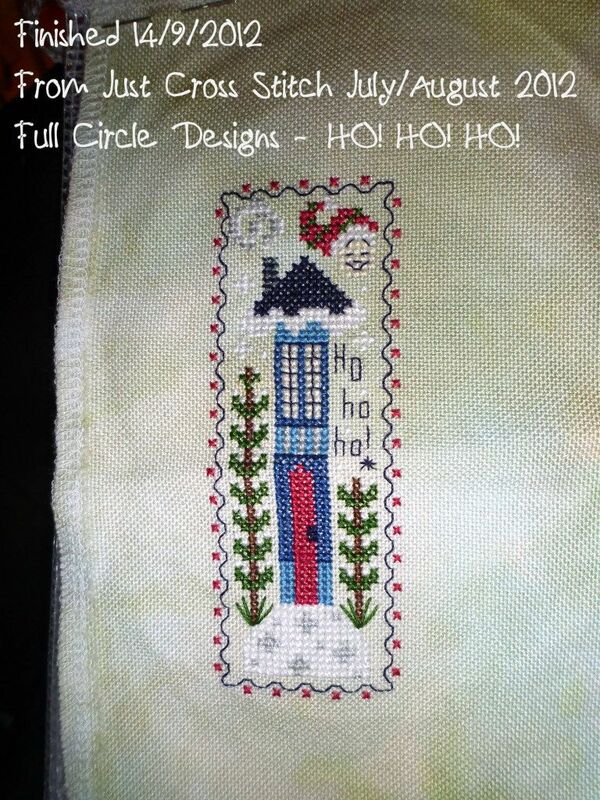 Great stitching:) Good luck for your Christmas deadline. I love the chart for 99. There are only 97 days until Christmas so you'll need to stitch more than one bottle a day! You've been busy - great stitching. I was looking at the 99 too, but I have so many other things to stitch that I will just sit back and watch yours progress. Hope you get it done in time for Christmas! Congrats on your finish! It is adorable.